We’d love your help. 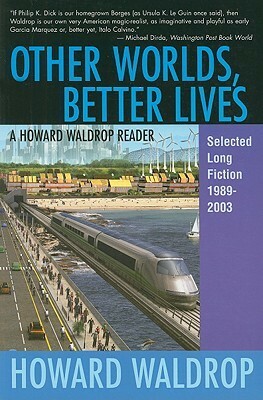 Let us know what’s wrong with this preview of Other Worlds, Better Lives by Howard Waldrop. Collects 7 longer pieces by this aclaimed writer." To ask other readers questions about Other Worlds, Better Lives, please sign up. Howard Waldrop is an American short story writer who deserves a much larger audience than he has. My review of his new short fiction collection is up at the SciFi.com site, here. A collection of Waldrops longer works from 89-03. I actually read about half of this book because I'd read two or three of the stories herein in different collections. Waldrop is a master of the short form and he never writes down to his readers. I discovered his work in the last ten years or so. I really can only imagine reading it before the internet became a constant presence and allowed easy research. I'm quite well-read, but Waldrop will still stump me with historic and cultural knowledge a A collection of Waldrops longer works from 89-03. I actually read about half of this book because I'd read two or three of the stories herein in different collections. Waldrop is a master of the short form and he never writes down to his readers. I discovered his work in the last ten years or so. I really can only imagine reading it before the internet became a constant presence and allowed easy research. I'm quite well-read, but Waldrop will still stump me with historic and cultural knowledge and send me scurrying to Google to look into the background of his stories. Most of Waldrop's work is some sort of alt-history. This isn't hard SF. Now and then it verges on fantasy. But it's always incredibly intelligent. "A Dozen Tough Jobs" sets the Labors of Hercules in the deep South in the 1930s. "You *Could* Go Home Again" finds a world in which FDR dies and Huey Long is elected President in 1932...but not for long. In "The Other Real World" we follow the children from 50s SF films dealing with the Cuban Missile Crisis. I really like this author, but sadly, these stories did not resonate with me. I got the impression that a lot of this work was the author’s tribute to sci-fi and personal influences from his life. How have I remained ignorant of Howard Waldrop's work????? This man is a masterful storyteller, with a wild imagination that creates stories worth telling. With the exception of the first story, which is a retelling of the 12 labors of Hercules, set in 1930's Mississippi, the stories are mostly fanciful alternate histories. What if Thomas Wolfe had survived his brain operation and lived to join the Technocracy political movement, helping it enough to win the Presidency of the US in 1940? (That st How have I remained ignorant of Howard Waldrop's work????? This man is a masterful storyteller, with a wild imagination that creates stories worth telling. Other stories wonder what would have happened if Richard Wagner had succeeded in leading the socialist revolution he (in real life) started in Dresden in 1849; what if, instead of Emile Zola, it was Georges Melies, Erik Satie, Marcel Proust, and Pablo Picasso who took up the cause of Capt. Alfred Dreyfuss -- not in print, but on film; what if all those annoying little kids from 1950s monster movies were in their late teens/early 20s during the Cuban Missile Crisis? Waldrop’s best reissue collection yet. From the Greek myths gone southern gothic in “A Dozen Tough Jobs” to the Francophile steampunk of “Fin De Cycle”, these stories are filled with wild humor and bizarre factoids. As one reviewer says, "set out as a dare to the reading public", Waldrop's work is always challenging, and entertaining when you get it. You just never know what you're going to get, so hang on for the ride. Decent collection of Waldrop's longer stories. Another excellent collection of short stories by the estimable Howard Waldrop. This man is truly a master of the short form. Howard Waldrop is a science fiction author who works primarily in short fiction. Waldrop's stories combine elements such as alternate history, American popular culture, the American South, old movies, classical mythology, and rock 'n' roll music.